Rennet curdles the milk. In calves, this coagulation takes place in the abomasum, the fourth and final stomach. For that reason, this stomach is also called the rennet-bag. 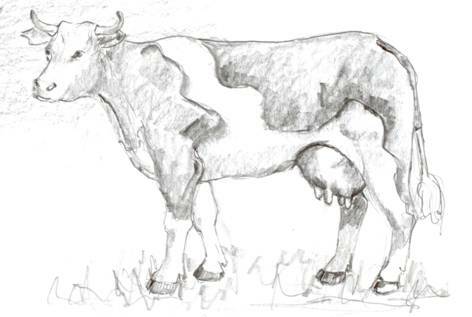 In an adult cow, it is located at the bottom of the belly behind the belly button. 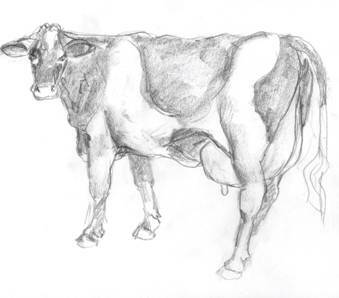 If the animal is standing, it is located at the lowest point between the four legs, not including the udder. Food from the third stomach enters the abomasum at the front; it then exits at the back into the intestine. The entrance and exit are fixed in place at half-height of the belly. But the middle section lies loose at the bottom of the abdomen. Large amounts of gas are released when the food is pre-digested in the rumen, the first stomach. Part of this gas is belched up, part is transported through the abomasum to the intestine. 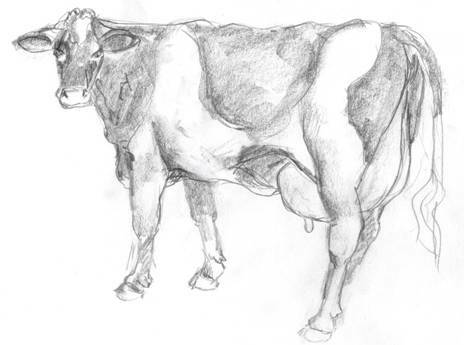 If the cow is given too much concentrate, the abomasum is not able to conduct the gas through fast enough and a gas bubble develops. And like every gas bubble, it wants to rise. If the rumen is not sufficiently filled with roughage, blocking the way to the top, then the abomasum with the gas bubble creeps upward. This generally occurs on the left side between the rumen and the abdominal wall. In doing so, the abomasum twists on its longitudinal axis and the bottom becomes the highest point. The result is a kink at the entrance from the third stomach and at the exit to the intestine, as these are fixed. The gas can no longer escape: it is stuck in the middle section like a balloon. And a gas bubble of this kind can be quite forceful: try holding an inflated child’s balloon under water by its string. There are two methods for getting a displaced abomasum back in its normal position at the bottom of the belly: an operation while the animal is standing or having the animal lie down and rolling it onto its back. The operation on a standing animal involves opening the belly on the left flank and then forcefully pushing the abomasum downwards. The gas is released from the abomasum as soon as the kinks at the front and back are corrected: partly via the third stomach back to the rumen and partly via the intestine. The middle section of the abomasum is then fastened to the bottom of the belly with a large suture. It is made from the inside to the outside next to the belly button and the suture knot is tied outside. The second technique involves having the cow lie down and then rolling it onto its back. The gas bubble in the abomasum will then once again migrate to the highest point in the abdomen and because the cow is on its back, the highest point will be the belly button. Precisely the location where the abomasum should be. Again a suture next to the belly button. This time from the outside through the abdominal wall into the abomasum and again the knot is tied on the outside. The result of both techniques is therefore the same: the abomasum is attached to the bottom of the belly with a suture. The reported results achieved with both techniques varied considerably. And so we compared these in our own practice. We operated ten cows while they were standing and we laid down and rolled over ten others. The follow-up treatment was similar to the extent that the animals were not given concentrate for a period of ten days after the procedure. The roughage differed from one farm to the other: the actual practice is simply not a research centre. The concentrate provided was then gradually increased up to a full ration. Roughly estimated, it takes three weeks for the abomasum to securely attach itself to the bottom of the belly. A few months after the procedure, seventeen of the original twenty cows were still present on the farms: three animals from the group that had been rolled had been disposed of due to complications that led one to suspect peritonitis. The remaining cows were doing well: they were producing an amount of milk that measured up to the other animals on the same farm. So rolling the animals went faster and easier, but the operation in the upright position gave a better result. But years later, our abomasum cows were not doing so well: half of the cows that had been treated were disposed of after just a short period. This became evident from the records of the mutual cattle insurance. What was the reason? The milk production on the farms had meanwhile increased enormously. The cows were no longer fed mainly grass, but rather lots of corn chaff and two to three times more concentrate. The number of abomasum relocations had increased tremendously. Not surprising, as there is a strong correlation between the dose of concentrate and an abomasum displacement: the higher the dose of concentrate, the higher the risk of a displaced abomasum. But why did these cows, that had been treated in the same way as always, develop so many more problems this time? Following the procedure, the abomasum is attached to the bottom of the abdomen. But it requires an estimated three weeks before the two are firmly grown together. Until that time, the development of a new gas bubble in the abomasum must be avoided. The suture thread can withstand the tractive force, but the wall of the abomasum will not: it will tear and then move back upward again. Which is why the animal should not be fed concentrate during the initial days after the procedure. Subsequently, the concentrate dose must be increased very gradually. And that is where things went wrong, as became evident during a follow-up on the treated cows: they were given a considerable amount of concentrate shortly after the procedure. Because many farmers have concerns that a cow that is not sufficiently fed at the start of the lactation period will lag behind in its milk production. I am called to a farm to examine two cows there. They are lagging behind in their milk production, while it has only been a few days since they calved. After examination both animals are found to have an abomasum displacement. That same day, I operated on both animals while they were standing. They are both doing well the next day. But on the second day, there is something wrong with one of the cows. Upon examination, the abomasum is found to be displaced again. And sure enough, despite clear instructions to the contrary, they had been fed substantial amounts of concentrate. “They won’t give milk otherwise, which is why I have them”, the farmer comments. He does not believe that the reduced milk production will be only temporary and that it will increase again after a few weeks. One of the cows was slaughtered, the other survived despite the concentrate. Changing feeding habits is a very sensitive issue for cattle farmers: it goes to the heart of their professionalism as farmers and injures their honour. A farmer’s saying reads: “Headstrong is also strong”. Still, it was a pity to lose the cow in this case.